You Can Fly: The Tuskegee Airmen by Carole Boston Weatherford, illustrated by Jeffery Boston Weatherford. Grades 5 and up. Atheneum Books for Young Readers, May 2016. 80 pages. Review copy provided by publisher. You guys. I am so, so pleased to be able to share an amazing behind-the-scenes look at this awesome new book. If you (or your kids/students) love adventure stories, war stories, and/or learning about American history, you are not going to want to miss this book. I am a huge fan of Carole Boston Weatherford and her latest does not disappoint. This small package packs a powerful punch. Like Kadir Nelson's We Are the Ship, the narrative is written in the second person (using "you"), which puts the reader right into the middle of the action. 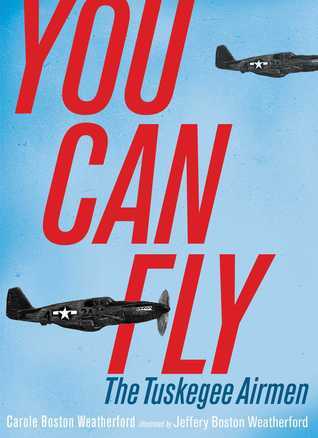 Using prose poems, Carole Boston Weatherford is able to get across a lot of information about the Tuskegee Airmen in an engaging read. Back matter includes an author's note, a detailed timeline, and resources for further information. Ms. Weatherford includes an extensive list of lesson plans and teacher resources on her website. 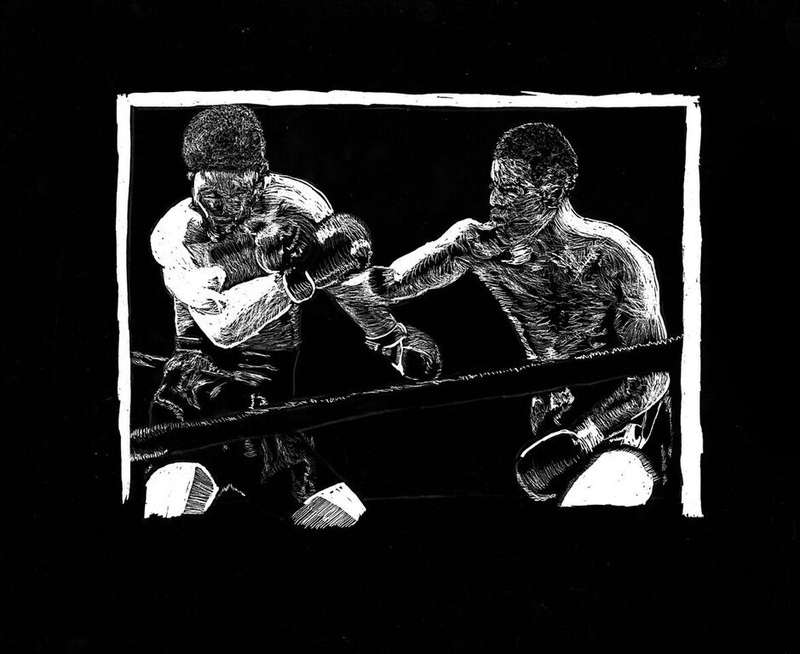 Black and white illustrations by her son Jerry Boston Weatherford illuminate the action. And I am privileged to share a special Q&A with debut illustrator Jeffery Boston Weatherford. If his name sounds familiar it may be because he is author Carole Boston Weatherford's son. How did you come to illustrate children's books? I doodled a lot in elementary school. In middle school, my mother enrolled me in studio art classes. I illustrated my first children’s book manuscript for my high school senior project. I used my mother’s unpublished manuscript Which Way to Dreamland? In college, during an internship with author/illustrator Jim Young, I created digital illustrations of the Airmen. Shortly after college graduation, I got my first contract. That project was killed and eventually reborn—with scratchboard illustrations—as You Can Fly. 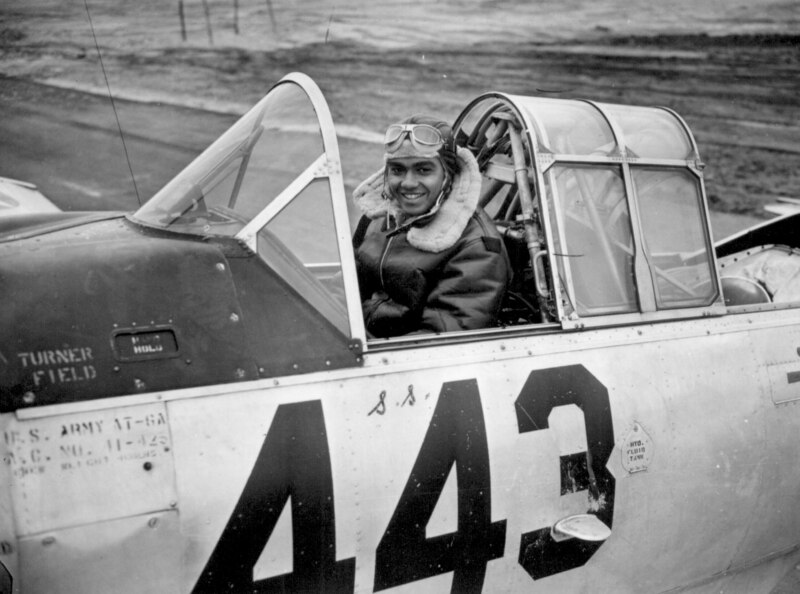 When did you first hear about the Tuskegee Airmen? I first heard about them when I was a boy. My family visited the Smithsonian Air and Space Museum and the Tuskegee Institute National Historic Site. I saw the Tuskegee Airmen’s planes, uniforms and other World War II artifacts. What was your inspiration for the illustrations? I always had dreams of flight. I watched the movie Red Tails and researched documentary photographs on the Library of Congress and National Archives websites. 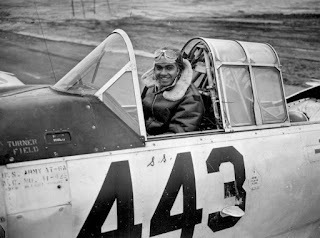 While doing my research, I had some dreams of meeting Tuskegee Airmen. Of course, I began by reading the poems. After I did my picture research for each poem, I drew a graphite study to layout the composition. 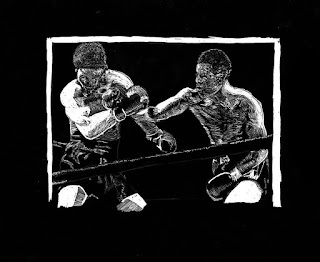 Once that was completed and approved by the publisher, I refined the image and transferred it to scratchboard. I used various nibs for different effects. I like the one of boxer Joe Louis punching the German Max Schmeling during their historic rematch. Do you have military ties in your family? My great great great grandfather fought in the U.S. Colored Troops during the Civil War. And my mother’s father was in the Army during World War II. He served in New Guinea and the Philippines. My grandmother still has his uniform. I think he would be proud of me and my mom. I want to thank the author and illustrator for stopping by and providing some great content today. I've said it before and I 'll say it again: don't miss this book!